Wow, what an event! All divisions have been run and conditions were excellent for a Hatteras wavesailing competition! Ranging classic Lighthouse for the Pros with mast+ set bombers and action captured in photos and video unseen before in Hatteras, to south side clean lines of chest+ set surf for all other divisions, Tuesday and Wed delivered the goods for awesome exposure of when it is on fire here on the islands. Here is one of the most impressive run at lip I have ever seen in Hatteras! Go Boujma Guilloul on this epic shot! Interestingly, coming off the lip, he was completely engulfed in whitewater where nothing but white was seen from the beach. Then suddenly he appeared out ahead of the mountain of white with sail in hand and recovered. He continued the ride into “no mans land” where he spent some time recovering; however, with this first hit, it was the most impressive perhaps seen in Hatteras! Epic! All in all, see the AWT web site for the latest news and final results for all divisions! Killer event and stoked for all that make it out here to catch classic “on fire” Hatteras wavesailing conditions! Also big shout out to Sam Bittner for leading the AWT again this year, and Andy McKinney at Wind-NC for supporting another excellent year as title sponsor for the tour stop! 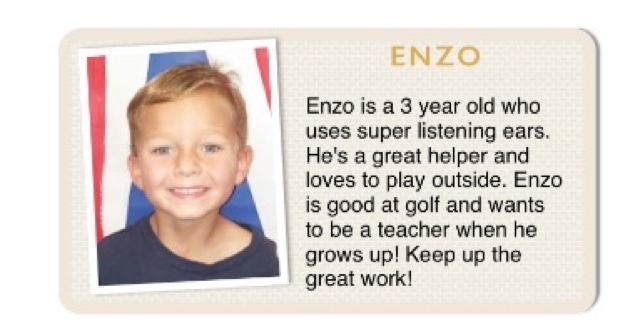 Enzo was featured in the school newsletter this week. Hatteras Wave Jam 2015 is on again this year as the top/only US East Coast windsurfing wave competition and Tour stop for the 2015 American Windsurfing Tour (AWT) The AWT is the premier US/International windsurfing tour featuring stops on the mainland US west/east coasts, Maui, Baja, and Peru. Five years running, the AWT features the best national/international wavesailing talent at all levels of competition. The AWT Hatteras Wave Jam is the pinnacle of US East Coast wavesailing action and is set to return again to Hatteras Island for our prime surf season in mid/late September! Hello Team Hatteras Wave Jam! We are all looking forward to making the trip to beautiful Avon. Invite your friends to come! The more the merrier This year we will be prepared to include SUP if the wind is light for part of the time so be sure to bring your boards. Windsurfing entry includes SUP entry but if anyone wants to only join SUP, the price is $ 50 for the week. Contest will run – Saturday condition dependent. Sunday, September20th: Wind-NC for opening/registration/check in: 6-8pm with beer and food. Wednesday, September 23rd: Pot Luck Dinner at AWT House in Avon. Address TBA. Friday, September 25th: Closing party at Ocean Air with food, beer, prizes and awards.